The Frame Design and Gallery in downtown Summerville has always served as a store of some type. The building first served as a grocery store when it was built some time in the early twentieth century. It remained a grocery for many years, changing hands over the decades. It also housed a craft store at one point. In the 1950s it was purchased by the Beasley family and once again became a grocery store until 1977, when it was bought by the Sutton family, who turned the space into a frame shop. 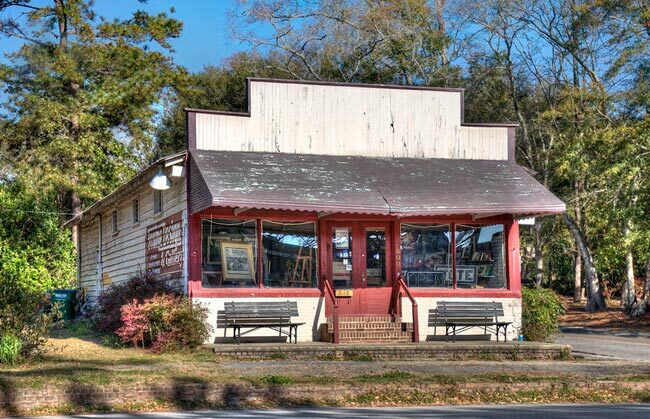 The business, known locally as “the frame shop” by some and still “Beasley’s” by others, is an iconic image in the community known as Flowertown in the Pines. Its location across the street from Rollings Middle School of the Arts and Summerville Elementary School ensures that its porch benches are usually occupied by students and parents after school, waiting to head home on foot or walk to Guerin’s, the neighborhood pharmacy and soda fountain. My matrilineal grandfather, Charles Sasportas, used to own the grocery store, and my mother used to work in the store. Please tell me soonest how I may obtain a copy of this photograph in color. She lived on Main Street in the Sasportas house. Thank you for your prompt attention to my request.